I have been doing multi-GB downloads at night (11pm-7am UK time) without using any of my 20GB monthly quota. This works brilliantly. I use a shareware program called iGetter to trigger the downloads in the night. I will also be able to set my Sky box downloading after 11pm, without using my quota. I now have a reliable internet service, and the price seems reasonable, £34.50/month. I did the installation myself, which saved some money and this made sure it was done correctly and with optimal alignment. I chose the system because my already poor BT ADSL sevice which used to give me 0.75Mb has slowly degraded, probably as more people use the phone cable for broadband, with just 0.5Mb in 2013 and it now drops out completely for the odd half hour. I am over 7 Km of old cable from the exchange and about 4 Km from my green box, so there are no plans for many years from now to improve the cabled service to this rural area in Gloucestershire. Good to hear some positives about satellite... like you there are others in locations that simply have no choice so good to know that the only choice is (just about) usable. How did you set the Sky box to only download over night? I assume this is for "on-demand" (which for you would be on-tomorrow). Can you post some speedtests; speedtest.net and thinkbroadband ones. Its rare to see Satellite speedtest results. I simply go to the Sky box at 11pm and set it to do any downloads I want. It does one at a time, so they queue up through the night. I just ran those speed tests, at 7pm on Tuesday, so this is a peak time. I agree with 5KM. It's nice to see some good reviews. I did use 1 way satellite once and that was okay - this being 2 way is very impressive! Also isn't Multicast/overnight still free? It used to be. Yes, unlimited from 11pm to 7am. What sort of speeds do you get when downloading over night? It is a long time since I wrote that original post. 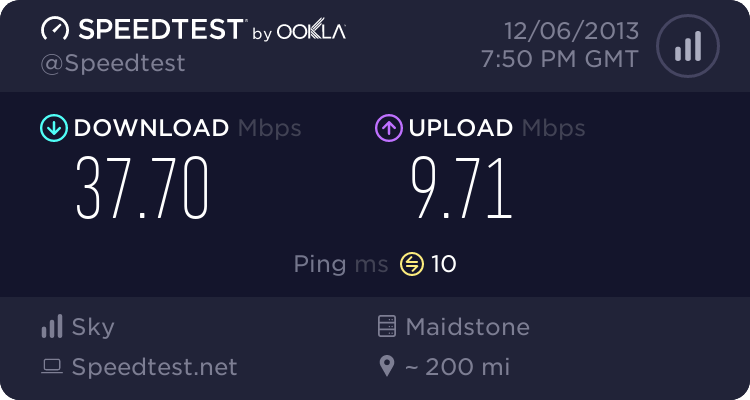 Speeds are poor at peak times, sometimes down to the level of my BT connection which has improved to 1Mb. The satellite 1Mb with latency is not nearly as good as the BT 1Mb without latency. Speeds at night (1am on) remain good. It still varies a lot but is in the 10-15Mb range. I am very lucky as the diggers have now reached my house bringing fiber. Once that network is connected up I will be getting 100Mb, upgradeable on demand to 1000Mb. So I will be able to cancel the satellite. Since I have completed the initial two years they tell me I can cancel with a month's notice. They want the modem and the transceiver back. The dish will go to the dump. Thanks for the reply, i currently get 0.48Mbps, which is fine for surfing the web, but streaming is meh and downloading updates is shocking especially for xbox one where most updates are 2gb+. There are no plans for BT to give us fiber, my cab has been fiber enabled but due to the distance fiber isn't available. I was thinking about getting satellite just for downloading things overnight and occasionally streaming movies etc, i would keep my existing phone line for gaming and general web browsing. It will certainly give you good updates at night, but you need to decide if the cost is worth it. Frankly in my case it was marginal, it was a good decision at the time because the BT service was dropping out completely at times, whereas it has got better and I now get 1Mb. If I was making the decision again, I would still do it but only for that reason. If I had 0.5Mb all the time I would probably live with that and wait until 2020 when you may be able to request 10Mb if government promises are delivered. I'm assuming you have already done all you can to optimise your home wiring, router etc. e.g. faceplate splitter on main socket where cable enters property. I also found that on a really poor line like yours a BT Home Hub 2 could get a faster connection than the later models. If you have a more modern one you can buy the old model on eBay for a few pounds, it could be worth trying. I've tried everything possible to my knowledge, i have a 2wire 2701HGV-C which is meant to be good for long lines.